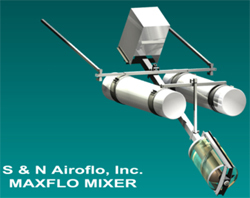 Save energy by applying S&N Airoflo's low speed, low HP mixers, with high pumping rates and directional flow. Anoxic mixing for dentrification in the activated sludge process. Enhances the performance of your floating aerators in applications where mixing dominated. Improves the performance of facultative lagoons by reducing algael growth, odor, short circuiting, and build-up of sludge and floating debris.